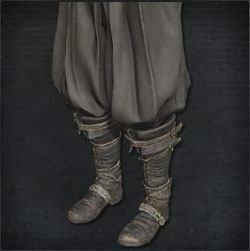 Wine Hakama is a Leg Armor/Attire in Bloodborne. It is part of the Yamamura Set. This was added with The Old Hunters DLC. "Garb of a distant Eastern land, worn by Yamamura the Wanderer." "This Eastern warrior pursued a beast for honorable revenge, then became a hunter of the League. But when he stared straight into impurity, it drove him mad." Can be obtained by killing Old Hunter Yamamura after opening his cell with the Underground Cell Key from the Research Hall. Other methods of obtaining it need testing.